Our most popular promotion is back for a limited time! For the next several weeks, we will be slashing our price on Teeth Whitening to $375 (normally $675). Phillips Zoom! WhiteSpeed is ideal for anyone looking for immediate whitening results. It is proven to be safe and effective and only takes an hour to complete. To redeem offer, patients must mention the '$375 Teeth Whitening' promotion when booking the appointment at our Melbourne Dental Clinic either online or speaking with our staff. Melbourne is a city of great coffee, food and nightlife. Unfortunately, the finer things in life have a price and it turns out some of the most delicious food and beverages can cause tooth discolouration. Even people that avoid common staining culprits like red wine, coffee and berries might find the natural shine of their teeth has diminished due to environmental factors or the ageing process. Luckily, there are now many options available for whitening teeth in Melbourne. While there are products available from pharmacies and other retailers you can use yourself, professional treatment from a dentist is safer and provides more reliable results. The amount of whitening that can be achieved is different for everyone, but most people that undertake professional whitening treatment at a dentist are happy with their new smile. The price of whitening treatments can vary considerably. Products available over-the-counter can range from $5 to around $80. The old saying “you get what you pay for” applies: the cheaper methods are less effective than professional whitening provided by a dentist. Some whitening kits, particularly the inexpensive ones, contain dangerous levels of hydrogen peroxide. Be particularly careful when buying online because kits may come from countries with different safety regulations to Australia. Professional teeth whitening is priced differently for each method. A take-home kit supplied by your dentist can cost up to $300, while in chair Teeth Whitening can cost up to $700 across Melbourne. Professional teeth whitening at a dentist isn’t the cheapest treatment available, but it is the safest, fastest and most effective way to whiten teeth. The concentration of whitening chemicals used are much higher than what is available over the counter, therefore providing quicker and more optimal results. Professional bleaching is a thorough process and begins with a dental hygienist cleaning your teeth and gums. This ensures tartar and other impurities don’t interfere with the whitening process. Next, the gums and lips are covered so bleach will not contact these areas. The dentist then evenly applies whitening agent to the exposed teeth to ensure a consistent finish. 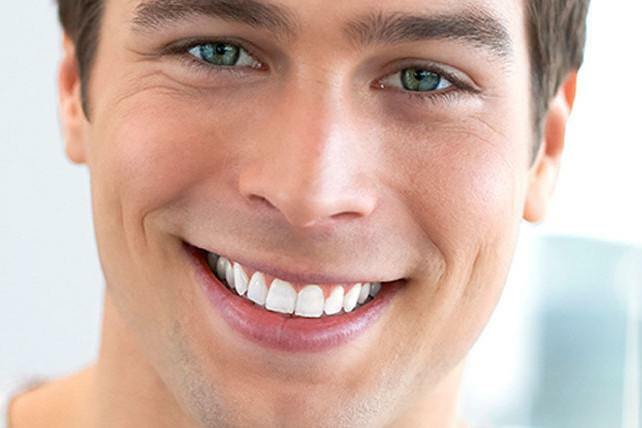 Popular brands of whitening product include ZOOM!® Whitening, BriteSmile® and Rembrandt®. The whitener will remain in contact with the teeth for a certain length of time, typically around 45 minutes. Some products will also require a light shone on to your mouth to activate the gel. Once treatment is complete the product will be removed from the teeth and a fluoride-based gel will be applied to reduce the common side-effect of tooth sensitivity. Unlike with all other whitening treatments, a professional will be nearby during the entire procedure. In some cases, your dentist will allow you to apply whitening gel to your teeth at home. This can be done both as a standalone treatment and to touch-up after an initial procedure at a clinic. 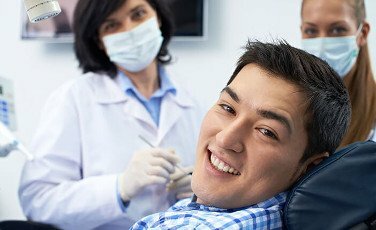 First a dentist will take an impression of your teeth using a mould, which dental technicians will then use to produce a tray expertly fitted to your mouth. Take-home trays are safer than over-the-counter trays because they are professionally fitted so they better protect the rest of your mouth from the gel. Next, your Dentist will educate you on how to look after your tray and how to use it properly. For most product you add the whitening gel to the tray with a syringe before placing the tray over your mouth. The tray is then left in for anything from 15 minutes to overnight, depending on the whitening product used. Take-home kits can be a great value option with many of the benefits of professional whitening. If you have ever wanted a brilliant white smile at home teeth whitening kits offer an affordable and safe solution. Compared to in-chair teeth whitening by a dentist at home teeth whitening kits provide everything you require with amazing results. Whitening toothpaste is available from supermarkets and pharmacies. Most toothpastes work through abrasive agents that remove more of the stains from the surface of the teeth than regular toothpaste. Whitening toothpaste can remove superficial stains, but it will not change more intrinsic discolouration. 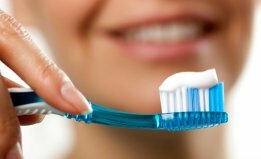 These toothpastes aren’t risk-free and can cause sensitivity and gum recession. To protect your teeth limit use to once a week, don’t brush too vigorously and check with your dentist to make sure your teeth aren’t being damaged. Strips can be purchased at a pharmacist or other store and usually contain either a peroxide or sodium chlorite bleaching agent. Unlike toothpastes, these products penetrate into the enamel on the tooth surface and can remove deeper stains. Although whitening strips can lighten teeth colour, they do not fit well into the curves between each tooth. This can cause a pattern of whiter colour on flat surfaces of the teeth and a yellower colour on the edges. There are some risks associated with whitening strips. While they can be purchased without visiting a dentist, if you haven’t had your teeth checked for a while and you have a cavity the bleach will get into it and cause extreme pain. Also, because strips aren’t custom fit to your teeth, they can contact the gums and irritate the tissue. What’s more, using this kind of treatment without professional advice might encourage you to use an unsafe amount while trying to get the best results. Like strips, kits purchased over the counter work through either a peroxide or sodium chlorite bleaching agent. Kits are usually administered through gel that is placed in trays designed to fit the teeth. Kits can produce a more consistent finish than strips because the gel covers all of the teeth. Recently, kits have begun to be very popular online, which include trays that can be custom-fit to the unique shape of your teeth by dipping a supplied mould in boiling water then biting it while it is soft. While not as good a solution as trays fitted by a dentist, these ‘boil-and-bite’ trays do a better job of keeping bleach away from gums than trays designed to fit any mouth. As with strips, whitening chemicals in kits can irritate and even damage the live tissue if it touches the gums or mouth lining. Whitening mouthwashes contain chemicals that can whiten teeth. Typically, they are the same active ingredients used by other methods such as whitening gels. However, bleach needs time to penetrate into the tooth and lighten its colour which is less likely to happen while rinsing the mouth for a relatively short time. Manufacturers say results can take up to 12 weeks of regular mouthwash use. A great smile is a great social asset and can boost self-confidence, so it’s no surprise, whitening treatments are now more popular than ever. Teeth whitening can improve your appearance for an upcoming job interview or special occasion, such as a wedding or graduation. You can also use whitening to reduce the effects of tooth discolouration or achieve a more youthful appearance. It is advisable to visit a dentist to better understand the cause of your tooth discolouration and get professional help on how to manage the problem. Before deciding to use a tooth whitening procedure, it is advisable to consult with a dentist and discuss the type and severity of discolouration you are experiencing and your motivations for undergoing the treatment. Individuals should be mature enough to understand the risks and limitations of the procedure. Not all types of tooth discolouration will respond the same way to whitening procedures. Whitening typically works best on yellow teeth and is less effective on grey, brown or black stains. It is important to have realistic expectations of how much improvement is possible. Human teeth are not perfectly white and vary in colour for each person. Treatment will not completely whiten teeth but will instead lighten the colour. Consult with your dentist to determine what treatments are available for your individual circumstances. Teeth whitening is safe when done correctly by a professional, although minor complications are possible. Some people notice their teeth are more sensitive during the 24 hours following treatment. Others report irritation of the gums, which is probably due to whitening gel leaking from the teeth. Too many treatments can leave the tooth looking pale and translucent. This change can be permanent and would require replacement of the tooth to fix – a major procedure. People are often eager to obtain the best possible results with their treatment. Sometimes the gel is left in for too long in the hope of achieving whiter teeth. This can cause the chemicals to penetrate too deeply and damage the inner layer of the tooth, the pulp. To avoid complications from using take-home whitening products, ask your dentist for advice or invest in a professional whitening treatment. Whitened teeth can lose their lustre in the months and years following the initial treatment and stains can return. Sometimes additional whitening treatments will become necessary, although with good dental hygiene and care white teeth can be maintained for longer. To prevent stains returning clean your teeth twice a day, but instead of brushing immediately after a meal, rinse your mouth with water then wait 30 minutes before cleaning your teeth more thoroughly. This routine will prevent the toothbrush from rubbing stains into the tooth surface. Beverages that stain should be avoided, especially immediately after receiving treatment. Smokers in particular will require many more repeat treatments to maintain whiteness. It’s also important to floss and use antibacterial mouthwash every day. 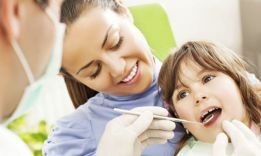 Finally, remember to visit a dental clinic twice a year for a check-up and clean. Professional teeth whitening is often all it takes for great results and a radiant smile. For more complex cases the dentist will combine whitening with other procedures for areas that are less responsive to bleach. Alternative treatments such as veneers are made from material that does not respond to whitening so touch ups are necessary to keep all your teeth the same colour. Veneers are thin structures attached to the front of the tooth. When used for whitening, first the dentist will apply the whitening treatment and then attach one or more custom-fitted veneers that match the new colour of the teeth. Veneers can also be used to reshape teeth, close gaps, conceal erosion and make small orthodontic adjustments. Dental bonding involves applying a resin to the teeth which is the same colour as your newly whitened teeth. The dentist will sculpt the resin then harden and polish it. Dental crowns are usually used for teeth with more severe problems or damage. Dentists are less likely to recommend them for whitening unless there are also other issues with the tooth. Crowns are fitted over the entire tooth and can be made to match the colour of your teeth. Which type of whitening method should I choose? Professional whitening is the safest and most effective treatment available. For faster results, whitening at a dental clinic is your best bet. For more value, ask your dentist for a take-home kit with professionally fitted trays. Do Fillings, Crowns or Veneers respond to whitening treatment? Whitening treatment will not change the colour of Fillings, Crowns or Veneers. After whitening they will need to be replaced to match the new colour of your teeth. I currently wear braces; can I get my teeth whitened? Whitening can be done while wearing braces or Invisalign, but the process is more difficult and has less consistent results. If using a take-home kit, the trays will need to include space for the brackets. If teeth are whitened at a clinic, the dentist will whiten around where the braces contact the teeth. Once orthodontic treatment is complete, more whitening might be needed for areas that were covered by the braces. Does teeth whitening make teeth permanently more sensitive? Studies have found the increased sensitivity of the teeth after whitening is temporary and generally only lasts 24 hours. How long does take-home whitening gel last for? If you keep it in the refrigerator, take-home gels can usually last up to 12 months. However, you should always read the expiry date before use, and ensure the gel is thick and gooey when you add it to your trays. 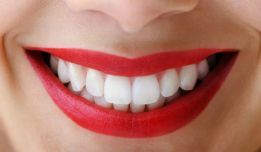 Where to get Professional Teeth Whitening in Melbourne? Australian Dentist Clinics are centrally located in the Melbourne CBD, we are open seven days a week and currently have a special promotion - $375 for Zoom! Teeth Whitening. Our dentists can provide you with expert advice on the most suitable treatment for your needs and circumstances, to book an appointment please call or use our online form and our staff will contact you to confirm your appointment time and date.